How was everyones Halloween by the way? What did you get up to? I ended up staying at Andrews house, we stayed in bed with a box of chocolates (which he didn't even touch haha, he's on a pre-holiday diet) and watched TV all night! If you know me, you'd know I love to experiment with wigs. I love the way that you can completely transform your whole look - un permanently. This colour is very me and although it's similar to my little blue streaks, I don't think it would be practical for me to have a full head of blue hair for everyday life but its a lot of fun for a few hours at a time! And it goes with my blog layout, clever blogger eyy!! 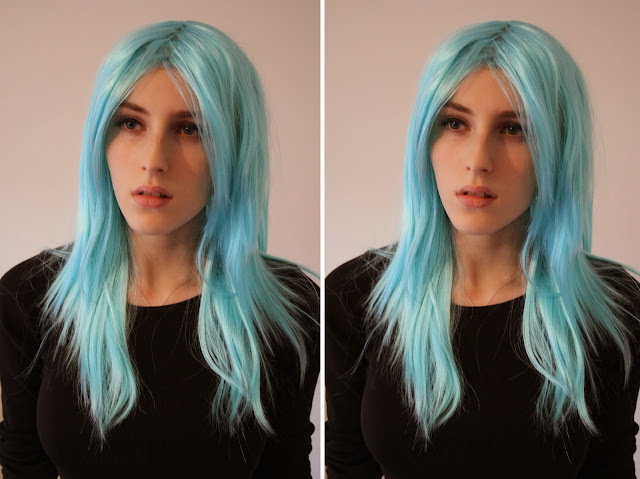 Wonderland Wigs are my favourite place to find pastel wigs, and I would totally recommend them if you were looking for a wig of your own. My favourite curly lilac one is from there and although very affordable, they are also well made! How do you like me with blue hair? The wig looks Awesome on you!